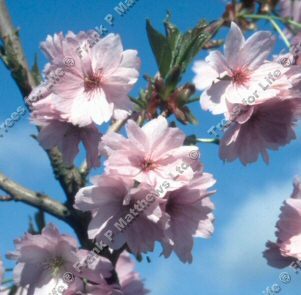 Buy Beniyutaka Japanese Flowering Cherry Tree online. FREE UK MAINLAND DELIVERY + 3 YEAR TREE WARRANTY. Semi-double, disc-shaped flowers which are a unique sugar pink colour with a distinctive dark central eye mark out Beniyutaka (Prunus 'Beni-yutaka') as something special amongst the many japanese flowering cherry varieties. As an added bonus, dramatic autumn colours of rich red-crimson are a real focus of interest. A spectacular robust and worthy tree. Beniyutaka is supplied at a height of between 1.5 and 2.4 metres in a 10-15 litre container for year round planting and better results than from either bare-root or rootballed stock.